An Islamic State of Iraq and Levant (ISIL) terror cell that was planning to attack a nearby military base was busted by Saudi security forces on May 5. Saudi security forces at the scene of a May 5 operation against an ISIL cell. A group of five ISIL jihadists was found hiding in Jawal Watani, a suburb of Mecca. Two terrorists were killed by security forces in the operation while two others killed themselves. According to Saudi sources, the terror cell was preparing to attack a base of Saudi emergency forces located five kilometers (3.1 miles) from where the ISIL fighters were hiding. Saudi security forces said they deployed helicopters to back up forces on the ground, fearing that the jihadists, who refused to hand themselves over to the police, would throw bombs at them. 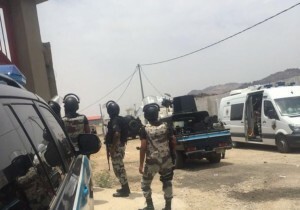 The operation came shortly after Saudi security forces arrested Ukab Atibi, a member of the ISIL cell that had carried out a suicide attack on a mosque used by members of a local security force in southwest Saudi Arabia in August 2015.